There are some 120 to 187 languages and dialects in the Philippines, depending on the method of classification. Almost all are Malayo-Polynesian languages. A number of Spanish-influenced creole varieties generally called Chavacano are also spoken in certain communities. The 1987 constitution designates Filipino as the national language and an official language along with English. Map of the dominant ethnolinguistic groups of the Philippines. While Filipino is used for communication across the country's diverse linguistic groups and is used in popular culture, the government operates mostly using English. Including second-language speakers, there are more speakers of Filipino than English in the Philippines. The other regional languages are given official auxiliary status in their respective places according to the constitution but particular languages are not specified. Some of these regional languages are also used in education. The indigenous scripts of the Philippines (such as the Kulitan, Tagbanwa and others) are used very little; instead, Filipino languages are today written in the Latin script because of the Spanish and American colonial experience. Baybayin, though generally not understood, is one of the most well-known of the indigenous Filipino scripts and is used mainly in artistic applications such as on the Philippine banknotes, where the word "Pilipino" is inscribed using the writing system. Additionally, the Arabic script is used in the Muslim areas in the southern Philippines. The 1987 Constitution declares Filipino as the national language of the country. Filipino and English are the official languages, with the recognition of the regional languages as auxiliary official in their respective regions (though not specifying any particular languages). Spanish and Arabic are to be promoted on an optional and voluntary basis. Spanish was the official language of the country for more than three centuries under Spanish colonial rule, and became the lingua franca of the Philippines in the 19th and early 20th centuries. In 1863, a Spanish decree introduced universal education, creating free public schooling in Spanish. It was also the language of the Philippine Revolution, and the 1899 Malolos Constitution effectively proclaimed it as the official language of the First Philippine Republic. National hero José Rizal wrote most of his works in Spanish. Luciano de la Rosa established that Spanish was spoken by a total of 60% of the population in the early 20th century as a first, second or third language. Following the American occupation of the Philippines and the imposition of English, the use of Spanish declined gradually, especially after the 1940s. Under the U.S. occupation and civil regime, English began to be taught in schools. By 1901, public education used English as the medium of instruction. Around 600 educators (called "Thomasites") who arrived in that year aboard the USAT Thomas replaced the soldiers who also functioned as teachers. The 1935 Constitution added English as an official language alongside Spanish. A provision in this constitution also called for Congress to "take steps toward the development and adoption of a common national language based on one of the existing native languages." On November 12, 1937, the First National Assembly created the National Language Institute. President Manuel L. Quezón appointed native Waray speaker Jaime C. De Veyra to chair a committee of speakers of other regional languages. Their aim was to select a national language among the other regional languages. Ultimately, Tagalog was chosen as the base language December 30, 1937, on the basis that it was the most widely spoken and developed local language. In 1939, President Manuel L. Quezón renamed the Tagalog language as Wikang Pambansa ("national language" in English translation). The language was further renamed in 1959 as Pilipino by Secretary of Education Jose Romero. The 1973 constitution declared the Pilipino language to be co-official, along with English, and mandated the development of a national language, to be known as Filipino. In addition, Spanish regained its official status when President Marcos signed Presidential Decree No. 155, s. 1973. The present constitution, ratified in 1987, designates Filipino and English as joint official languages. Filipino also had the distinction of being a national language that was to be "developed and enriched on the basis of existing Philippine and other languages." Although not explicitly stated in the constitution, Filipino is in practice almost completely composed of the Tagalog language as spoken in the capital, Manila; however, organizations such as the University of the Philippines began publishing dictionaries such as the UP Diksyonaryong Filipino in which words from various Philippine languages were also included. The present constitution is also the first to give recognition to other regional languages. The constitution also made mention of Spanish and Arabic, both of which are to be promoted on a voluntary and optional basis. Language map of the 12 recognized auxiliary languages based on Ethnologue maps. Filipino is an official language of education and also the major language of the broadcast media and cinema, but less important than English as a language of publication (except in some domains, like comic books) and less important for academic-scientific-technological discourse. Filipino is used as a lingua franca in all regions of the Philippines as well as within overseas Filipino communities, and is the dominant language of the armed forces (except perhaps for the small part of the commissioned officer corps from wealthy or upper-middle-class families) and of a large part of the civil service, most of whom are non-Tagalogs. There are different forms of diglossia that exist in the case of regional languages. Locals may use their mother tongue or the regional lingua franca to communicate amongst themselves, but sometimes switch to foreign languages when addressing outsiders. Another is the prevalence of code-switching to English when speaking in both their first language and Tagalog. The Constitution of the Philippines provides for the use of the vernacular languages as official auxiliary languages in provinces where Filipino is not the lingua franca. Filipinos at large are polyglots; In the case where the vernacular language is a regional language, Filipinos would speak in Filipino when speaking in formal situations while the regional languages are spoken in non-formal settings. This is evident in major urban areas outside Metro Manila like Camarines Norte in the Bikol-speaking area, and Davao in the Cebuano-speaking area. As of 2017[update], the case of Ilocano and Cebuano are becoming more of bilingualism than diglossia due to the publication of materials written in these languages. The diglossia is more evident in the case of other languages such as Pangasinan, Kapampangan, Bikol, Waray, Hiligaynon, Sambal, and Maranao, where the written variant of the language is becoming less and less popular to give way to the use of Filipino. Although Philippine laws consider some of these languages as "major languages" there is little, if any, support coming from the government to preserve these languages. This may be bound to change, however, given current policy trends. There still exists another type of diglossia, which is between the regional languages and the minority languages. Here, we label the regional languages as acrolects while the minority languages as the basilect. In this case, the minority language is spoken only in very intimate circles, like the family or the tribe one belongs to. Outside this circle, one would speak in the prevalent regional language, while maintaining an adequate command of Filipino for formal situations. Unlike the case of the regional languages, these minority languages are always in danger of becoming extinct because of speakers favoring the more prevalent regional language. Moreover, most of the users of these languages are illiterate[specify] and as expected, there is a chance that these languages will no longer be revived due to lack of written records. Aside from the two official nationwide languages used in the Philippines, namely, Filipino and English, other languages have been proposed as additional nationwide languages. Among the most prominent proposals are Japanese, and Spanish. Major languages by region. Regions marked with black diamonds denote the language comprises only a substantial minority of the populace. According to Ethnologue, a total of 182 native languages are spoken in the nation and four languages have been classified as extinct: Dicamay Agta, Katabaga, Tayabas Ayta and Villaviciosa Agta. Except for English, Spanish, Chavacano and varieties of Chinese (Hokkien, Cantonese and Mandarin), all of the languages belong to the Malayo-Polynesian branch of the Austronesian language family. One or more of these is spoken natively by more than 90% of the population. A Philippine language sub-family identified by Robert Blust includes languages of north Sulawesi and the Yami language of Taiwan, but excludes the Sama–Bajaw languages of the Tawi-Tawi islands, as well as a couple of North Bornean languages spoken in southern Palawan. Eskayan is an artificial auxiliary language created as the embodiment of a Bohol nation in the aftermath of the Philippine–American War. It is used by about 500 people. Philippine languages are often referred to by Filipinos as dialects, partly as a relic of the inaccurate vocabulary used in literature during the American period (1898–1946). While there are indeed many hundreds of dialects in the Philippines, they represent variations of no fewer than 120 distinct languages, and many of these languages maintain greater differences than those between established European languages like French and Spanish. Siya nga dili kahibalo molingi sa iyang gigikanan, dili makaabot sa iyang padulngan. Quien no ta bira cara na su origen no de incarsa na su destinación. Ay nung sabi mira i donde ya bini no di llega na destinación. An tawo nga dili kabayu mulingi sa ija gingkanan, dili makaabot sa ija pasinguran. The amount of dialectal variation varies from language to language. 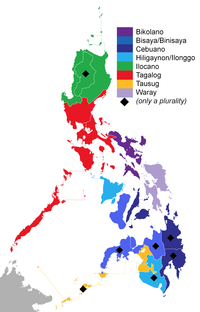 Languages like Tagalog, Kapampangan and Pangasinan are known to have very moderate dialectal variation. For the languages of the Bicol Region, however, there is great dialectal variation. There are cities and towns which have their own dialects and varieties. Below is the sentence "Were you there at the market for a long time?" translated into certain varieties of Bikol. The translation is followed by dialect and corresponding language, and a city/town in Bicol where they are spoken. The final translation is in Tagalog. Below is a chart of Philippine languages. While there have been misunderstandings on which ones should be classified as language and which ones should be classified as dialect, the chart confirms that most have similarities, yet are not mutually comprehensible. These languages are arranged according to the regions they are natively spoken (from north to south, then east to west). Below are population estimates from the 2000 Philippine census by the Philippine Statistics Authority on the number of Filipinos who speak the following 18 languages as a native language. Endangered and extinct languages in the Philippines are based on the 3rd world volume released by UNESCO in 2010. In a separate study by Thomas N. Headland, the Summer Institute of Linguistics in Dallas, and the University of North Dakota called Thirty Endangered Languages in the Philippines, the Philippines has 32 endangered languages, but 2 of the listed languages in the study are written with 0 speakers, noting that they are extinct or probably extinct. All of the listed languages are Negrito languages, the oldest languages in the Philippines. Northern Aurora 250 Reid, per. comm. Northern Quezon 400 Reid, per. comm. There have been numerous proposals to conserve the many languages of the Philippines. According to the Komisyon ng Wikang Filipino, there are 135 ethno-linguistic groups in the country, each having their own distinct Philippine language. Among the proposals include (1) "establishing a dictionary & sentence construction manual" for each of the 135 living languages in the country, (2) "video documentation" of all Philippine languages, (3) "revival of the ancient scripts of the Philippines" where each ethnic group's own script shall be revived and used in schools along with the currently-used Roman script in communities where those script/s used to be known, (4) "teaching of ethnic mother languages first" in homes and schools before the teaching of Filipino and foreign languages (English or Arabic), and (5) "using the ethnic mother language and script first in public signs" followed by Filipino and foreign languages (English and/or Arabic) and scripts, for example, using Sebwano first followed by Filipino and English underneath the sign. Currently, only the fourth proposal has been made by the national government of the Philippines. A National Script bill has been filed in Congress in support of the third and fifth proposal, however, the bill only mandates the usage of the ancient script compatible with the national language, which is Filipino. Arabic is used by some Filipino Muslims in both a liturgical and instructional capacity since the arrival of Islam and establishment of several Sultanates in the 14th century. Along with Malay, Arabic was the lingua franca of the Malay Archipelago among Muslim traders and the Malay aristocracy. The 1987 Constitution mandates that Arabic (along with Spanish) is to be promoted on an optional and voluntary basis. As of 2015[update] Arabic is taught for free and is promoted in some Islamic centres predominantly in the southernmost parts of Philippines. It is used primarily in religious activities and education (such as in a madrasa or Islamic school) and rarely for official events or daily conversation. In this respect, its function and use is somewhat like the traditional roles of Latin and Spanish in Filipino Catholicism vis-à-vis other currently spoken languages. The first significant exposure of Filipinos to the English language occurred in 1762 when the British invaded Manila during the Seven Years' War, but this was a brief episode that had no lasting influence. English later became more important and widespread during American rule between 1898 and 1946, and remains an official language of the Philippines. English is used in official documents of business, government, the legal system, medicine, the sciences and as a medium of instruction. Filipinos prefer textbooks for subjects like calculus, physics, chemistry, biology, etc., written in English rather than Filipino. [dubious – discuss] However, the topics are usually taught, even in colleges, in Tagalog or the local language. By way of contrast, native languages are often heard in colloquial and domestic settings, spoken mostly with family and friends. The use of English attempts to give an air of formality, given its use in school, government and various ceremonies. A percentage of the media such as cable television and newspapers are also in English; major television networks such as ABS-CBN and GMA and all AM radio stations broadcast primarily in Filipino, as well as government-run stations like PTV and the Philippine Broadcasting Service. However, a 2009 article by a UNICEF worker reported that the level of spoken English language in the Philippines was poor. The article reported that aspiring Filipino teachers score the lowest in English out of all of the subjects on their licensing exams. A large influx of English (American English) words have been assimilated into Tagalog and the other native languages called Taglish or Bislish. There is a debate, however, on whether there is diglossia or bilingualism, between Filipino and English. Filipino is also used both in formal and informal situations. Though the masses would prefer to speak in Filipino, government officials tend to speak in English when performing government functions. [according to whom?] There is still resistance to the use of Filipino in courts and the drafting of national statutes. On August 22, 2007, three Malolos City regional trial courts in Bulacan decided to use Filipino, instead of English, in order to promote the national language. Twelve stenographers from Branches 6, 80 and 81, as model courts, had undergone training at Marcelo H. del Pilar College of Law of Bulacan State University College of Law following a directive from the Supreme Court of the Philippines. De la Rama said it was the dream of former Chief Justice Reynato Puno to implement the program in other areas such as Laguna, Cavite, Quezón, Nueva Écija, Batangas, Rizal, and Metro Manila. Diplomatic ties with the Ming dynasty among some established states or kingdoms in Luzon and direct interactions and trade overall within the archipelago as a whole may go as far back as the early 10th century. Mandarin Chinese is the medium of instruction in Chinese schools and the lingua franca of mainland and overseas Chinese. However, the Lan-nang variant of Hokkien Chinese is the majority language the Chinese in the Philippines, who immigrated from the Fujian (pronounced locally as Fukkien or Hokkien) province in China. Other varieties of Chinese such as Hakka and Yue Chinese (especially Cantonese) are spoken among a few Chinese in the Philippines whose ancestral roots trace all the way back from the Guangdong and Guangxi provinces in Southern China. As with Spanish, many native languages have co-opted numerous loanwords from Chinese, in particular words that refer to cuisine, household objects, and Philippine kinship terminology. The Japanese first came to the Philippines around the 11th century CE, the first country they emigrated to, as well as in waves from the 15th century, 17th century, late 19th century, 1900s, 1930s, and the 1940s. There is a small Japanese community and a school for Japanese in Metro Manila due to the number of Japanese companies. Also there is a large community of Japanese and Japanese descendants in Laguna province, Baguio City, and in the Davao Region. Davao City is a home to a large population of Japanese descendants. Japanese laborers were hired by American companies like the National Fiber Company (NAFCO) in the first decades of the 20th century to work in abaca plantations. Japanese were known for their hard work and industry. During World War II, Japanese schools were present in Davao City. Malay is spoken as a lingua franca in the southernmost parts of the Philippines, from Zamboanga down to Tawi-Tawi among a minority of the Tausug, Sama-Bajau, and Yakan peoples. It is also spoken as a daily language by the Malaysians and Indonesians who have settled, or do business in the Philippines. It is also spoken in southern Palawan to some extent. It is not spoken among the Maranao and Maguindanao peoples. Brunei, Malaysia, Indonesia and the southern Philippines are largely Islamic and the liturgical language of Islam is Arabic, but the vast majority of Muslims in the Philippines have little practical knowledge of Arabic beyond limited religious terminology. Ancient Malaysian and Indonesian cultures and civilizations in ancient Malaya, Sumatra and Java influenced the history, lifestyles, and culture of the Filipino peoples. The Malay language, along with Philippine languages belonging to the Malayo-Polynesian language family, has also had an immense influence on many languages spoken in the Philippines. This is because Old Malay used to be the lingua franca throughout the archipelago, a good example of this is Magellan's translator Enrique using Malay to converse with the native Sugbuanon (Cebuano) during this time period. An example of Old Malay and Javanese languages spoken in Philippine history can be seen in the language of the 10th century Laguna Copperplate Inscription. When the Spanish had first arrived in the Philippines in the 16th century, Old Malay was spoken among the aristocracy. It is believed that Ferdinand Magellan’s Moluccan slave Enrique could converse with the local leaders in Cebu Island, confirming to Magellan his arrival in Southeast Asia. Today, Indonesian is taught as a foreign language in the Department of Linguistics and Asian Languages in the University of the Philippines. Also, the Indonesian School in Davao City teaches the language to preserve the culture of Indonesian immigrants there. The Indonesian Embassy in Manila also offers occasional classes for Filipinos and foreigners. Since 2013, the Indonesian Embassy in the Philippines has given basic Indonesian language training to members of the Armed Forces of the Philippines. In an interview, Department of Education Secretary Armin Luistro said that the country's government should promote Indonesian and Malaysian, which are both related to Filipino and other Philippine languages. Thus, the possibility of offering it as an optional subject in public schools is being studied. Since pre-Spanish times, there have been small Indian communities in the Philippines. Indians tend to be able to speak Tagalog and the other native languages, and are often fluent in English. Among themselves, Sindhi and Punjabi are used. Urdu is spoken among the Pakistani community. Only few South Asians, such as Pakistani, as well as the recent newcomers like speakers of Tamil, Nepali and Marathi retain their own respective languages. Spanish was introduced in the islands after 1565, when the Spanish conquistador Miguel López de Legazpi set sail from Mexico and founded the first Spanish settlement on Cebú. Though its usage is not as widespread as before, Spanish has had a significant influence in the various local Philippine languages such as providing numerous loan words. Several Spanish-based creole language varieties collectively known as Chabacano have also emerged. The current 1987 constitution makes mention of Spanish in which it provides that Spanish (along with Arabic) is to be promoted on an optional and voluntary basis. In 1593, the first printing press in the Philippine islands was founded and it released the first (albeit polyglot) book, the Doctrina Christiana that same year. In the 17th century, Spanish religious orders founded the first universities in the Philippines, some of which are considered the oldest in Asia. During colonial rule through Mexico, Spanish was the language of education, trade, politics, and religion, and by the 19th century, became the colony's lingua franca although it was mainly used by the educated Filipinos. In 1863, a Spanish decree introduced a system of public education, creating free public schooling in Spanish. In the 1890s, the Philippines had a prominent group of Spanish-speaking scholars called the Ilustrados, such as José Rizal. Some of these scholars participated in the Philippine Revolution and later in the struggle against American occupation. Both the Malolos Constitution and the Lupang Hinirang (national anthem) were written in Spanish. Under U.S. rule, the English language began to be promoted instead of Spanish. The use of Spanish began to decline as a result of the introduction of English into the public schools as a language of instruction. The 1935 constitution establishing the Philippine Commonwelath designated both English and Spanish as official languages. The 1950 census stated that Filipinos who spoke Spanish as a first or second language made up only 6% of the population. In 1990, the census reported that the number had dwindled to just 2,500. A 2012 survey estimates that while around 1 million people can speak Spanish with varying degrees of competency, only around 439,000 people can speak the language at a native level. Spanish briefly lost its status as an official language upon promulgation of the 1973 constitution but regained official status two months later when President Marcos signed Presidential Decree No. 155. In the 1987 constitution, Spanish is designated as an "optional and voluntary language" but does not mention it as an "official language". Spanish was dropped as a college requirement during Corazón Aquino's administration. Former president Gloria Macapagal Arroyo, a third-language Spanish speaker, introduced legislation to re-establish the instruction of Spanish in 2009 in the state education system. Today, the language is still spoken by Filipino-Spanish mestizos and Spanish families who are mainly concentrated in Metro Manila, Iloilo and Cebu. It remains an optional subject in some academic institutions, such as the University of Santo Tomás in Manila and the University of San Carlos in Cebu. Many historical documents, land titles, and works of literature are written in Spanish and are still not translated into Filipino languages, despite the fact that some such as land titles have legal value. Spanish, through colonization has contributed the largest number of loanwords and expressions in Tagalog, Cebuano, and other Philippine languages. The Academia Filipina de la Lengua Española (Philippine Academy of the Spanish Language), established in 1924, is a founding member of the Association of Academies of the Spanish Language; an association of the various Spanish academies of the world which cooperate in the standardizing and promotion of the Spanish language. Among its past and present academics are former President Arroyo, former Foreign Affairs Secretary Alberto Romulo, and Archbishop of Cebú Cardinal Ricardo Vidal. Caviteño (Chabacano de Cavite), spoken in Cavite City, Cavite. Ternateño (Chabacano de Barra), spoken in Ternate, Cavite. Ermitaño (Chabacano de Ermita), formerly spoken in Ermita, Manila but is now extinct. The last reported speakers were a woman and her grandson during the 1980s and 1990s. ^ "The Constitution of the Republic of the Philippines - GOVPH". ^ a b "DepEd adds 7 languages to mother tongue-based education for Kinder to Grade 3". GMA News Online. July 13, 2013. Retrieved 2018-08-06. ^ "Philippines". Ethnologue. Retrieved 2017-09-28. ^ McFarland, C. D. (1994). "Subgrouping and Number of Philippine Languages". Philippine journal of linguistics. 25 (1–2): 75–84. ISSN 0048-3796. ^ The Komisyon sa Wikang Filipino enumerated 134 Philippine languages and 1 national language (Filipino) present in the country through its Atlas Filipinas map published in 2016. ^ a b "Philippines - EDUCATION". Retrieved 15 March 2015. ^ Manuel L. Quezon (December 1937). "Speech of His Excellency, Manuel L. Quezón, President of the Philippines on Filipino national language" (PDF). p. 4. Retrieved 2009-01-14. ^ a b Andrew Gonzalez (1998). "The Language Planning Situation in the Philippines" (PDF). Journal of Multilingual and Multicultural Development. 19 (5, 6): 487–525. doi:10.1080/01434639808666365. Archived from the original (PDF) on 2007-06-16. Retrieved 2007-03-24. ^ a b "Presidential Decree No. 155 : Philippine Laws, Statutes and Codes". Chan Robles Virtual Law Library. Retrieved 15 March 2015. ^ Ricardo Ma. Nolasco. "Maraming Wika, Matatag na Bansa - Chairman Nolasco" (in Filipino). Commission on the Filipino Language. Retrieved 2007-10-04. ^ Gonzales, Richard DLC. "NIHONGO NO BENKYOU: WHY AND HOW FILIPINOS LEARN JAPANESE LANGUAGE". ^ "Similarities and Differences between Japan and Philippine Cultures". www.slideshare.net. ^ Felongco, Gilbert (2007-12-05). "Arroyo wants Spanish language in schools". GulfNews. Retrieved 2018-08-06. ^ Lewis, M. Paul; Simons, Gary F., eds. (2015). "Ethnologue: Languages of the World" (18 ed.). Dallas, Texas: SIL International. ^ a b c d Headland, Thomas N. (1 January 2003). "Thirty endangered languages in the Philippines". ^ See, Stanley Baldwin (August 15, 2016). "A primer on Baybayin". GMA News Online. Retrieved 2018-08-06. ^ a b Adriano, Joel. "The Philippines: still grappling with English". Safe-democracy.org. Forum for a safer democracy. Retrieved 15 February 2015. ^ "Inquirer.net, 3 Bulacan courts to use Filipino in judicial proceedings". ^ a b "Philippinealmanac.com". Archived from the original on 1 July 2012. Retrieved 15 March 2015. ^ Paul Kekai Manansala. "Quests of the Dragon and Bird Clan". Retrieved 15 March 2015. ^ "Ancient Japanese pottery in Boljoon town". Retrieved 15 March 2015. ^ "Philippines History, Culture, Civilization and Technology, Filipino". Retrieved 15 March 2015. ^ "Korean, foreign languages not Filipino subject replacement: DepEd". Philippine News Agency. Retrieved 12 December 2018. ^ "Indonesian Language Club - Embassy of Indonesia - Washington D.C." Archived from the original on 2016-04-30. ^ "Going Banana". Retrieved 15 March 2015. ^ "The Indian in the Filipino - INQUIRER.net, Philippine News for Filipinos". Archived from the original on 21 June 2015. Retrieved 15 March 2015. ^ Rising India and Indian Communities in East Asia. Retrieved 15 March 2015. ^ Indian Communities in Southeast Asia (First Reprint 2006). Retrieved 15 March 2015. ^ "Estadisticas: El idioma español en Filipinas". Retrieved 15 March 2015. ^ "Spanish language in Philippines". Retrieved 1 March 2015. Carl Ralph Galvez Rubino. "The Philippine National Proverb". Translated into various Philippine languages. Retrieved July 28, 2005. Christopher Sundita. "Languages or Dialects?". Understanding the Native Tongues of the Philippines. Archived from the original on 2006-06-16. Retrieved July 28, 2005. Dedaić, Mirjana N.; Nelson, Daniel N. (2003). At War With Words. Walter de Gruyter. ISBN 3-11-017649-1. Retrieved 2007-10-04. Hamers, Josiane F. (2000). Bilinguality and Bilingualism. Cambridge University Press. ISBN 0-521-64843-2. Retrieved 2007-10-04.